What would our descendants say about this time period? How would we, as a people, be written into their histories? What stories would they tell of us? Perhaps our ancestors would say that this was a time of recklessness, willful ignorance, of extravagance, and of excess. They might mourn the loss of ecological diversity and habitat that we did not protect, they would lament the loss of cultures and languages, the loss of so many things. Perhaps our descendants would say that we pillaged the land and many of its inhabitants by not knowing how to curb our own greed; that we were victims to our own quest for abundance; and that we filled the air with carbon simply because we wanted to move faster. Or, perhaps, our descendants will tell a different story. Yes, they would say, the larger culture and government leaders didn’t want to make change and thereby created a more difficult, less ecologically stable, world. But there were others, their ancestors, who thought differently. Their ancestors saw with open eyes the destruction surrounding materialist patterns of life, and they worked to change them physically and spiritually. Their ancestors paved the way for a new paradigm of thought and action: one of balance, respect, and nurturing for the living earth and all her inhabitants. And the reason that the descendants are here to record this history was because of their ancestors’ bravery, determination, and commitment to the sacredness of the land and the interconnected web of all life. 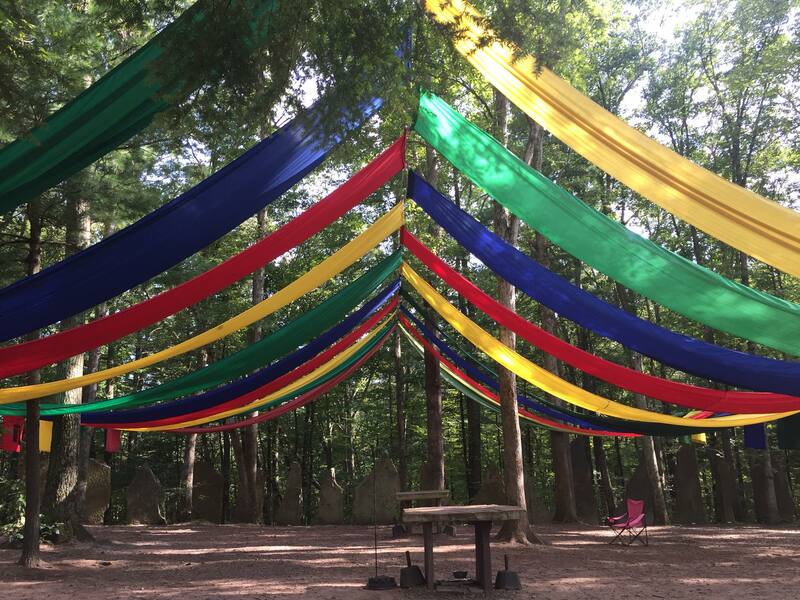 It was with these thoughts of future generations, and what legacy that we might leave them, that I journeyed to Four Quarters Interfaith Sanctuary for my second year at Stones Rising. 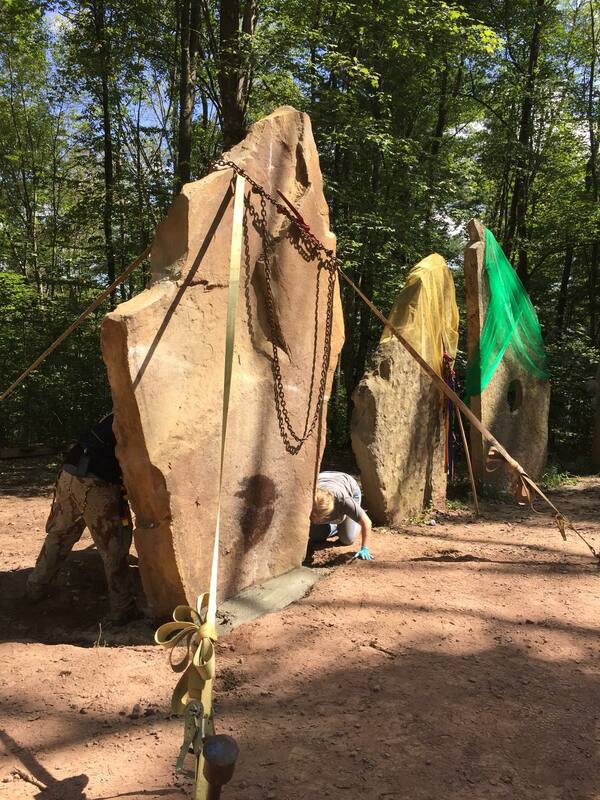 As I wrote last year, as we engaged in the physical activity of raising a very large standing stone to add to the growing stone circle, we created something powerful. Stones rising is not just about us in the present moment, but rather, about building something that will last generations and cultivating a community that allows that work to continue to happen. And so, as I arrived at Four Quarters for Stones Rising, I was on the land once again, I was with my tribe once again, and we had sacred work to do. As we gathered at the top of the mountain in the quickening darkness in preparation for pulling our first stone, we sensed the heaviness of that moment. Our ancestors were watching. Our descendants were watching. In the deepening darkness, by torchlight, we strained at the ropes to guide this new stone carefully, perilously, towards its new home. The magic is in the pull–the quiet on the lines, the breath of anticipation, the stone crew guiding the process. Fire and earth are in perfect synthesis as we complete our journey to the stone circle with the first of our two stones. Our ritual that evening invited us directly to engage with the past and the future. We call forth and talked with our ancestors in front of the western “father stone” in the circle. They are proud of the legacy that we are now living. 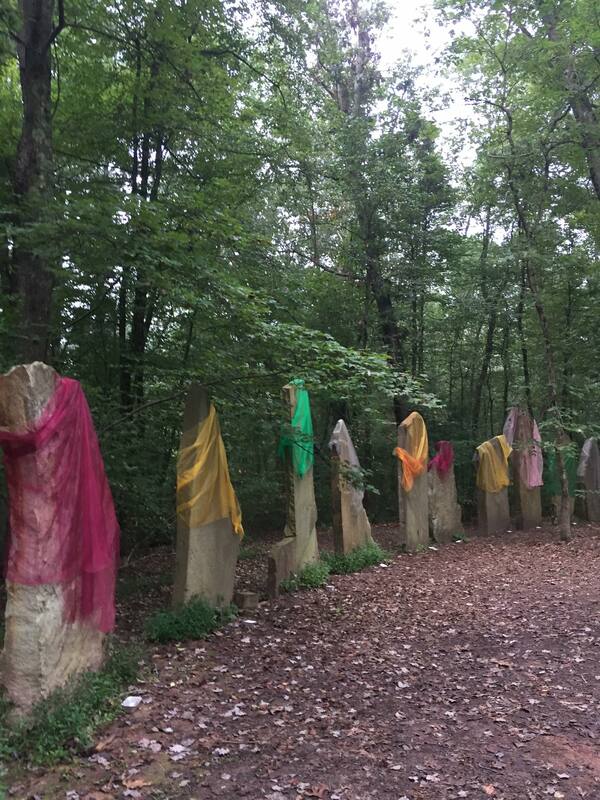 We then called forth and talked with our future descendants, in the east, near the “mother stone.” We listen to their voices, spanning through the ages, thanking us and urging us to continue our work now, so that they may come into being. The next day, we prepare for the long pull. It is aptly named–we are pulling the second stone, the one we will also be raising this year–and it is a 5 ton stone, two tons heavier than what we pulled the night before and we have to pull it a much longer way. 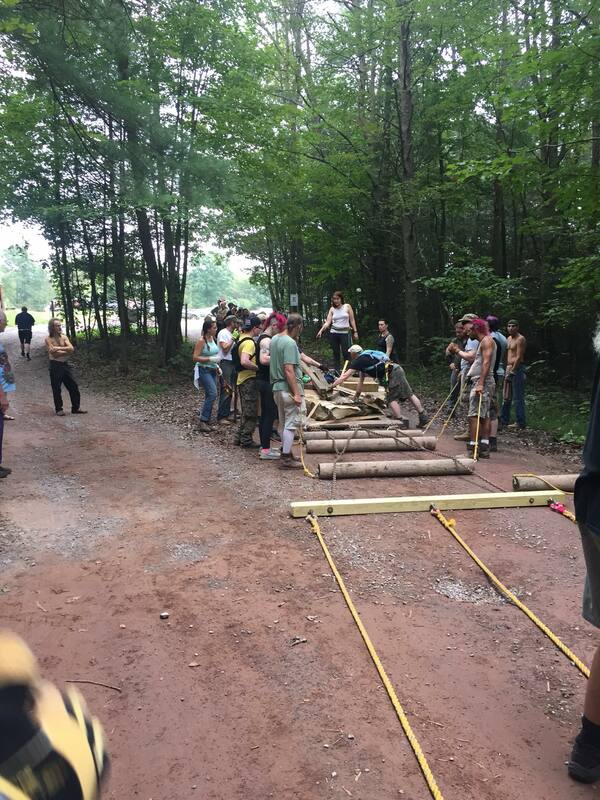 We once again assemble at the top of the mountain; our stone is strapped to a simple wooden sled, ready to join its brothers and sisters in the circle. We take three breaths and pull. We pull for the ancestors, whose DNA floats in our veins and whose song we can hear on the breath of the wind. We pull for the descendants, those young people among us, those in the womb, those yet to be conceived. We pull for the land, our battered and beaten land, who, despite humanity’s treatment of her, still has skies that fill us with air, whose soils still produce our food, and whose rivers and storms still quench our thirst. We pull for our community, strained as though it may be, knowing that this work is good work, and necessary work. The stone does not move. We strain at our ropes. Living in this time sometimes feels like the first long and desperate tug on that rope–when you keep pulling and pulling and nothing happens. When your feet slide in the grass and sweat drips from your brow and nothing happens. When you feel your muscles straining to the point of collapse, and nothing happens. When everyone around you is likewise straining, giving it their all, and nothing happens. And then, when you know you can’t pull for another second, the stone finally moves a few inches, and then it moves faster, and you know no matter how hard it is to pull or how much time it takes, you will get there. Hours later, we arrive with our stone in the stone circle. We break, and have more ceremony, feasting, and song. The next day, the entire tribe gathers, first to be fed the delicious rolls of bread baked all night by the corn mothers. With nourishment in our bellies, we go as a community into the stone circle, making our commitments to the work, the land, and each other. We hold space as a community, and participate as we are able, to raise the stone into its place in the circle. People sing, the drummers offer a steady beat, the crones offer a cup of tea, and the most delicious pickles can be found at the snack table. We sit among our tribe, celebrating this moment. Ropes are brought out and we move the stone into position. Everything happens very slowly, ever so slowly, as only a stone can move. The stone raises up, inch by inch, with careful guidance and steady hands. The stone is a lot like the cultural and ecological challenges before us–the stone can only move an inch at a time. It is a very heavy stone. We can’t expect change all at once. We need to endure, we need to understand that we are beginning the work of generations, and it will take us and our descendants to fully realize the dream of centering us, as humans, back in line with the living earth. The stone is seated into place; a cheer goes up among the community. Now, we celebrate. Now, we feast. Now, through ceremony and song, we welcome the new stone into its home in the east. The East. The direction of the descendants; the direction of spring; the direction of new beginnings and new hopes. There in the east, our descendants stand watching, holding their breath, and dreaming of a tomorrow not yet here. Our newest eastern stone, arisen! The challenges we face as a world are so severe. Sometimes, I can’t fall asleep at night, my spirit heavy with the burden of the now, and even heavier with the burden of the future. When I look at little children, I think to myself, how will this world be for them when they grow up? What can I do now to ensure that they thrive? What about their children’s children? When we welcome that new stone in the east, I felt my heart lighten. We are in incredibly difficult times, where change seems impossible, but like the slow raising of the standing stone, we–as a an earth-centered spiritual tribe, as a people dedicated to the land–are building a better paradigm for ourselves, our community, and our descendants. Each stone we move is a legacy for those yet unborn and for the stories they will tell, for the histories they will write. We are in the process of becoming ancestors. Whatever our larger culture may offer future generations, we can leave a legacy that offers the seeds of hope, of re-connection to the living earth, and of living in balance. And, we can leave them the stones.